While not a concours d’elegance, Carmel Artomobilia, is included here because it is a significant celebration of the art and design of the automobile. 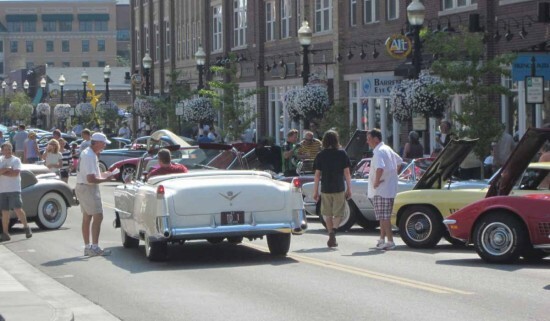 Each year, this unique event features a distinct gathering of recognized artists, collector cars, and automotive enthusiasts, showcased on the streets of the Carmel Arts & Design District, nort of Indianapolis. Artomobilia will feature more than 400 enthusiast and collector cars across more than 26 classes, including Super Car, Exotic, Classic, Sports car, European, Domestic, Vintage and Racers, attracting nearly 15,000 visitors from Carmel and the surrounding areas. Carmel Artomobilia focuses on display and appreciation over competition and although each of the automobiles is truly magnificent, this event is not just about cars; it’s about the art and automotive enthusiasts. The event embraces the essence automotive art and design by uniquely combining the artwork of local galleries and artists, with the presentation of significant automobiles and their iconic design. To that end, select local gallery owners commission a painting each year that features one of the most noteworthy cars presented against the canvas of the District. The artwork is completed during the course of the day, and auctioned off the following evening with proceeds going to a local charity. (From event website) .